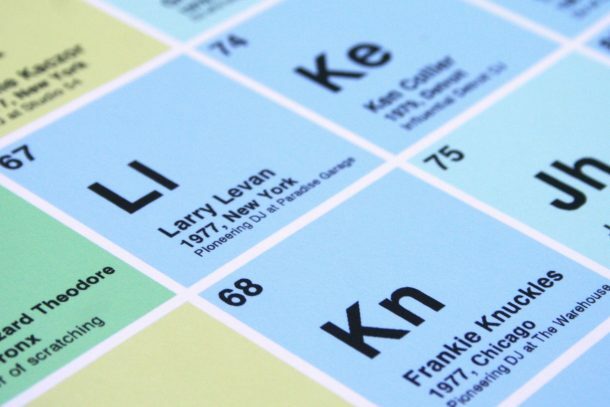 Is Your Favorite Selector On This Periodic Table Of DJs? Now here's some chemistry we actually want to learn. Did you always struggle in chemistry class? Well, here is a periodic table that you might find a little bit easier to understand and remember. Designed by the artist Paulo Guimaraes (a.k.a. 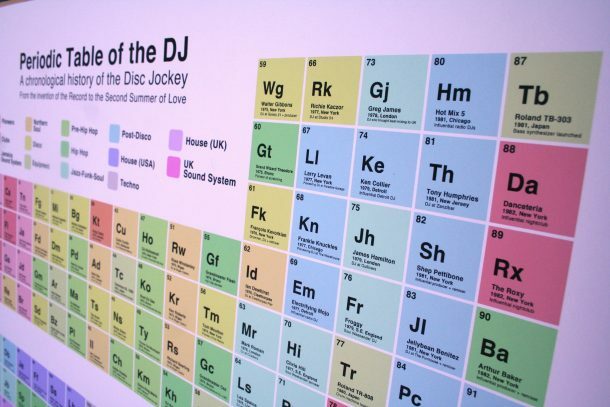 Art Misfit), this limited edition “Periodic Table Of The DJ” chronicles over 130 years of DJ culture, from Thomas Edison’s invention of the Phonograph in 1887 all the way up to the major figures and institutions in the Second Summer of Love in 1988. Inspired by the book Last Night A DJ Saved My Life by Bill Brewster and Frank Broughton, the print features pivotal DJs from all around the world—from Balearic pioneer DJ Alfredo to the vanguards of Chicago and Detroit house and techno—that have changed the face of electronic music. It also features famous clubs like the Danceteria—the infamous New York haunt that disco journalist Tim Lawrence detailed for us here—and is catergorized by the different musical contexts in which they developed, from UK sound system to post-disco. Now that’s some chemistry we actually want to learn. The periodic table is available from the Art Misfit store here. You can visit his Instagram to see more of his work here.